When the matter of cleaning coins is on the table for discussion, many coin collectors, from experts to card-carrying numismatists, all seem to disagree on the merits of the practice. On one side of the argument, there is the ‘never clean a coin under any circumstances’ position, while on the other is heard the ‘you should never clean a coin, but if you have to, use a gentle cleaner like a mild soap or olive oil’. Both sides seem to convey valid and certainly precautionary points, and to ere on the side of that caution, both obviously indicate that most coins should never be cleaned. However, while it certainly matters which side one happens to view as being the right one, there are a few methods out there that many feel are at least an ‘option’ to consider in hopes of cleaning a coin safely, without damaging it to the point of being a worthless, and shiny, metal slug. With that said, when discussing the practical methodology or techniques involved with cleaning a coin, it is best to restrict the advice to referring only to the removal of certain types of ‘surface’ dirt like grime, glue, or tape residue for instance, and that no method suggested involves the removal or elimination of any luster or metal would ever be recommended. What is intended, by describing methods pertaining to coin cleaning, is to restore a coin to its original condition, as it came from the mint, and utilizing a cleaning method that leaves the original qualities and characteristic of the coin’s luster completely intact. In the end, be advised that whatever method it attempted, the responsibility is left to the one making the attempt, because after all, the value of the coin collection rests upon the integrity and the skills of the collector. Given that, here are what may be considered the Top Ten Tips to Clean Coins, no matter which side of the coin you are on. Tip #1 – Distilled Water Technique: One of the gentlest methods known to clean coins is by using distilled water. This method requires soaking the coin for 24 hours, then removing the coin and gently apply a scrubbing action to the coin with a soft toothbrush. Changing the water and repeating the process can be attempted until the coin is clean. Distilled water contains virtually no dissolved minerals. When the coin is placed in it, the minerals on the coin transfer to the distilled water until it is saturated. Tip #2 – Soap and Water Technique: Soap works by decreasing the surface tension of water, therefore permitting the water to penetrate the dirt on the surface of the coin by emulsifying or breaking down the grease, and then by absorbing the dirt into the soapy mixture. 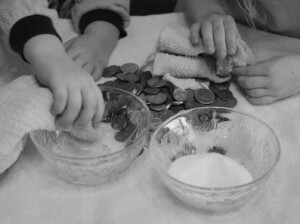 Soak the coins in soap and water first, and gently apply a scrubbing action to the coin with a soft toothbrush. Rinse the coins as required. Tip #3 – Olive Oil Technique: The olive oil has the ability to penetrate the surface dirt and therefore loosens it from the coin. Place the coin in a suitable container and cover the coin completely with the olive oil. Allow the coins to soak for one to six months or longer, and periodically change the oil if it becomes discolored. After soaking, clean the coin with soap and water and gently scour the coin with a soft toothbrush. Tip #4 – Mechanical Cleaning Technique: This method requires the use of a tool to physically dislodge or scrape the dirt off a coin, such as brushes, toothpicks, bamboo skewers, or dried rose thorns. The experienced coin cleaner may use a battery-powered, variable-speed drill, with diamond-dusted bits and dental picks to loosen and remove the accumulated dirt. It is recommended to work from the outer rim of the coin to the center. Tip #5 – Calgon® Technique: Calgon® is a product designed to be used as a water softener, which removes high mineral content from ’hard’ water. Using a toothpick, apply the Calgon® to the oxidized and encrusted areas on the coin, while taking maximum care not to get the solution on the patina of the coin. Allow it to set for a few minutes, using a toothbrush or a toothpick to dislodge the residue and then rinse. Repeat the process until the coin is clean. Tip #6 – Ammonia Technique: This method is best for cleaning oily types of dirt. To make a silver coin cleaning solution, mix one part house-hold ammonia to six parts water. Soak the coin in the solution, then gently scour the silver coin with a small soft toothbrush to loosen any dirt, using care not to scratch the surface. Always rinse the coin after cleaning. Repeat until the surface of the coin is clean. Tip #7 – CLR Technique: CLR is a diluted form of acid that removes calcium, lime and rust. This product is used as a spot application on oxidized coins to soften and break up the residue. Do not allow the CLR to come in contact with the patina. Always rinse the coin after cleaning. Repeat the process until the coin surface is clean. Tip #8 – MS-70 Technique: MS-70 coin cleaner is a blend of industrial detergents and surfactants designed to remove surface contamination from metal without disturbing the metal surface itself. Surface contamination can be seen as PVC, tarnish, fog, oil, dirt, etc. When MS-70 is applied, the surfactants (wetting agents) first break the surface tension of the contamination. Tip #10 – eZEST Technique: This cleaner is also used for jewelry and has some mild acid as a component. It cannot be applied to a coin’s surface for more than a few seconds or it can harm the surface of a coin. The application must be dabbed on and immediately removed. It is a liquid tarnish remover for gold, silver, and copper coins. This is the preferred coin cleaner, cleaning solution and “dip” for collectors and dealers.